Moonshine is the name of the game here at D'Vine Foods! 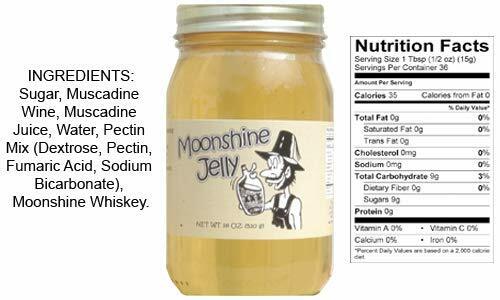 Our line of Moonshine products began with just Moonshine Jelly and has expanded into many flavors, such as Blackberry, Blueberry, Peach Pie, Apple Pie, and more, not to mention pickles and hot sauces. The "Moonshine Man" is a familiar face on many of our products and can be found at vendors all over the country. All of our Moonshine products are alcohol free, but still have the distinct Moonshine taste that adults and children alike will enjoy.